"Augusta, Maine, Post Office "
An image scanned from a color postcard depicting the post office at Augusta, Maine. Undated. Located at 295 Water Street, the building was opened in 1890 and is built of Hallowell granite. 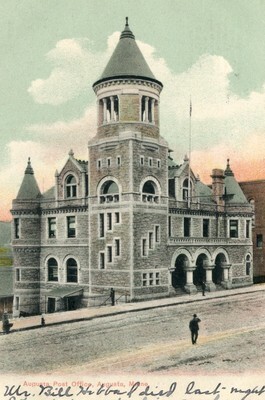 It served as Augusta's post office until 1960, and is currently known as the Old Federal Building.